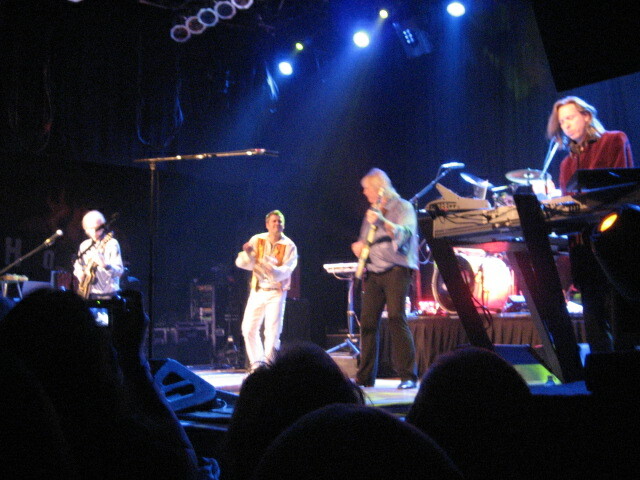 I was at this show and enjoyed it FOR WHAT IT WAS--Howe, Squire and White performing Yes music with two new friends. Unlike the Drama era, which resulted in a new album and tour under the Yes moniker, they are not pretending this is "the new Yes." It's an evening of Yes music performed by 3/5 of the classic lineup with an understudy singer on board (and a good one at that). Oliver Wakeman was competent, but Yes have had so many keyboardists over the years that his role is less of an issue than that of lead vocal. So what if Benoit squawked a couple high notes or missed a chord on his acoustic during "Machine Messiah?" Jon did that kind of stuff too and it never made or broke the overall quality of a show. People looking for a recreation of their fondest concert of Yesyears past will likely be disappointed. People going in with an open mind (and ears) will enjoy themselves. It was great to experience the guys and the music in a smaller venue again--they haven't done this since the Ladder tour. Hello, all you Yes fans. I attended the show last night. It was my 24th Yes show; the first was at Elyria Catholic High School outside of Cleveland in November 1971, when they were just introducing the material from Fragile. Bill Bruford was still on drums, Rick Wakeman was drunk, and a great time was had by all, including my then 17-year-old self. As to Benoit, he did really well. His voice was uncannily Jon-like, although there were definitely some moments that didn't quite ring true. I'd cite "Soon," from the end of the Gates of Delirium... It occurred to me that this song came so deeply from Jon's soul that it would simply be impossible for anyone else to sing it in equal fashion. That's not a knock against Benoit, that's just reality. What I loved about the show was, after seeing the band so may times in huge venues with lots of flash, this brought it all.... back home. There they were, so close to the fans, unadorned by staging, like old friends dropping by... Just them and their wondrous stories, well-told, again. If you have the tour coming your way and are sitting on the fence, ignore the nay-sayers and get to the show. The level of dignity and grace is enormous, and looking at Steve Howe, who could easily pass for north of 70 years and actually seems to be approaching the frailty stage, one has to ask how many more times this will happen. God bless and keep Yes. Hey all, I just wanted to pass this link along. It's a petition to get Yes in the Rock N Roll Hall of Fame. Over-critical fans of Yes - please wake up and be happy with what you have. I was in attendance last night at the Yes concert at the H.O.B. in Cleveland, and was satisfied with their show. Nit-pickers are NEVER going to be satisfied with any replacement of Jon Anderson, no matter who it was and how he sounded. No, he was not as good as Jon, but did you think he would be? I think the guy did a credible job, and was in pretty good voice - you can't expect his range to be the same as Jon's. I was very impressed with Steve, Chris, and Alan, and was surprised at how well they can still play. Do people really think they are going to be as capable in playing their instruments in their 60's as they were in their 30's? Will Peyton Manning still be the quarterback of the Colts in 20 years? If you said YES to either of these 2 questions, you need professional help. Be happy that the band is still intact as it is, and is not one of those other bands that have disappeared, or have REALLY been hampered by either a death in the band, or by them splitting up or losing a key member. After all, nobody is ever going to see bands such as the Doors, Led Zeppelin, Boston, the Cars, Genesis (probably), Emerson, Lake & Palmer, Lynard Skynard, Foghat, and Pink FLoyd in concert ever again. Be happy that you have a functioning and still very capable band in the current version of YES. And if there are those who are critical of Oliver Wakeman - do you really think the guy is going to go off and do "Journey to The Center of The Earth" while sitting in for his father? If you read any interviews with the guy, he is very respectful to the history of Yes and just wanted to do a good job for them. He wasn't interested in "going Hollywood" and showing off, as it would not be the time and place for that type of display. He did a fine job, as all the other band members did. I agree with Karen and Jim. We are lucky we are able to see these guys in any way, shape, or form. 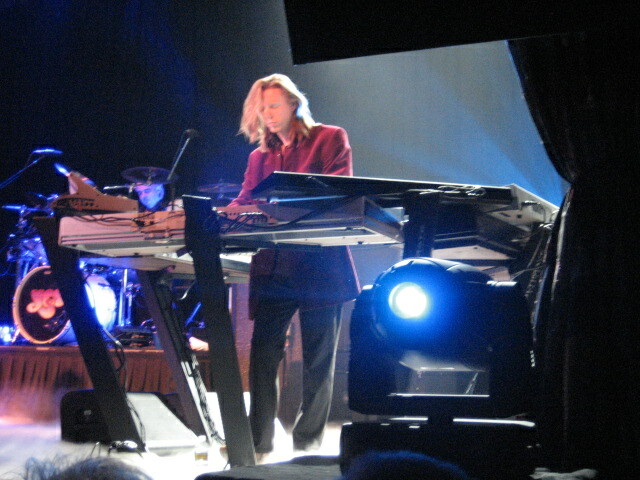 It sounds like we may have seen the last of Mr. Anderson and Wakeman has been slowing down gradually over the past years. It was not a perfect show, but the vibe was there and the crowd was giving them the accolades they deserve! I think Wakeman could have smiled or looked a little more enthusiastic....but I'll take what I can get. Way to go guys and thank you for the great evening! I've seen them a total 9 times with Close to the Edge played at least 3, maybe 4 times. The MUSIC last night was fanstastic. Steve and Chris were SOLID. What was it about Benoits voice that didn't connect with you? I thought he did an excellent job. No, he's not Jon, but who can be Jon anyway...come on..Jon is Jon. I did not view Benoit as his replacement, rather an extension. Benoit captured the music the best way he could but he also has his own flare. I don't know, I'm not a music critic, but man, I thought these guys really ROCKED last night. It just blows my mind that there are fans that were dissapointed with this group. Good thing were not talking politics, cause this thread would be a whole lot longer and with swearing. Hi everyone. I should tell you that Cleveland, OH was my first Yes conert ever. I've always been a fan of the band, but I didn't realize just how much. I left the club with a much deeper appreciation for music than when I walked in, and I've always felt that I had a strong appreciation from the beginning. I certainly believe you are all entitled to your opinions, but I have to say that Benoit David tows the line as well as could ever be expected of anyone. He didn't author the lyrics he's singing with the band, so you can't expect him to have the same points of view about the music as Jon, but I had no doubts that he "got it". 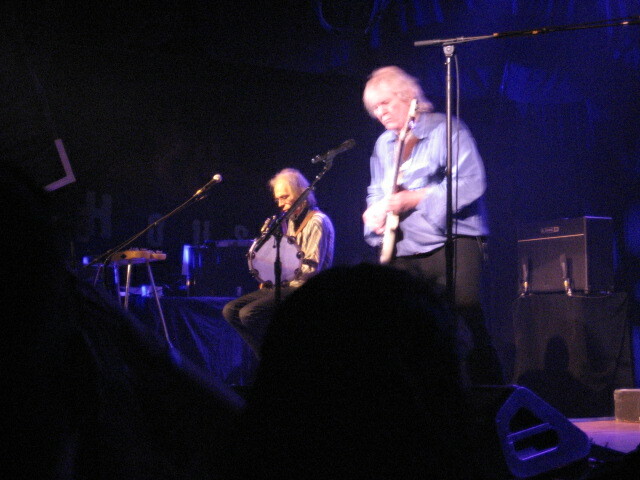 Steve Howe,Chris Squire, and Alan White are legends in their own rites, and I felt privileged to see them play for me, especially in such an intimate environment. I could see the fingerings of every bass and guitar chord or riff. I could see the tips of the drumsticks as they slammed the drums all night. I couldn't have asked for anything more. All three of them still have passion for their music, and it's obvious. I've seen bands phone it in from the stage before, and that is obvious too. Oliver Wakeman? Anyone with a complaint about Oliver has a misplaced complaint. He was incredible last night. I can't say much more about it; incredible just about sums it up. Thank you, Jim for opening my ears and mind last night, and the VIP passes were sublime. I got home and was headed to bed when something hit me. I plugged in, hit the record button, and got about 25 minutes of stuff recorded that I didn't know was in me... I'll let you hear it when I get it finished. There's no doubt in my mind that Yes opened a door... now the only question is: How wide? Calm down, we're not electing a president here! It's just music. For the record, I don't think any show will ever top seeing them In The Round in 1979. My point is that I don't care about comparisons, just a review of the show I saw last night. And, again, it's just my opinion, shared by the many others in attendance. Peace! This was the worst live version of Close To The Edge ever!!!!!!!! not the best. If this maybe is the best version you ever saw, it must be the only version you ever saw. Are you kidding me. How can anyone say that, plus with no Jon. This was a watered down terrible version with weak keyboards!!!!!!!!! Jim, luckily you didn't compare TFTO, GFTO, In The Round, 9012LIve, Union, show with this garbage. TFTO, GFTO, In The Round had the greatest sound system and lights everrrrrr!! This shows sound system and lights are a farce! Lowwww budget! 9012LIve, Union were better than this but not better than TFTO, GFTO, In The Round. Also. +1 to Karen's review, which posted as I was typing mine. ...and that is why reviews are opinions and not hard facts. (No offense intended to previous post by Ned). It is true that Benoit and Oliver did not write the material that they are performing on this tour, but without them, Yes would not be on tour and that would be a shame. I don't view them as imitators, just musicians who are performing as required and they are only getting better with each passing performance. I wish I could catch one more performance in my old home town of Orlando at the end of the tour. My guess is that those fans will be getting the best shows of all. My nephew, a guitarist and blues fan, was along for his first Yes concert and was stunned by the level of musicianship he experienced. He recalled many exact details of the show over the two hour drive home. 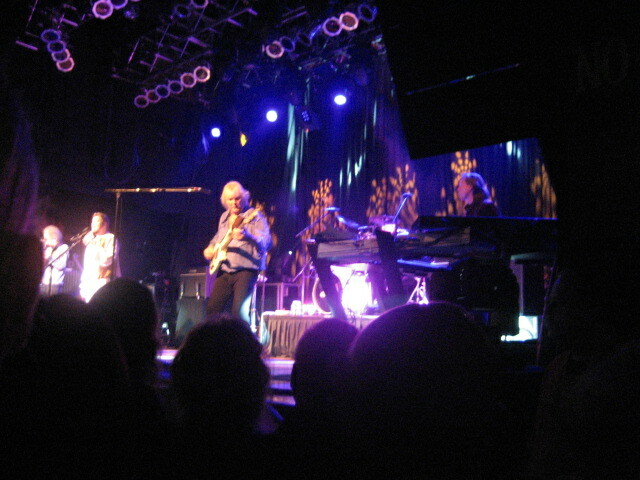 I have seen Yes in every line-up since TFTO in 1974 and few concerts left me as inspired as last nights show in Cleveland. It was the third performance on this tour for me and by far the best. As a musician, sound engineer and long time fan, I could compare this tour to TFTO, GFTO, In The Round, 9012LIve, Union, etc.... but what would be the point? 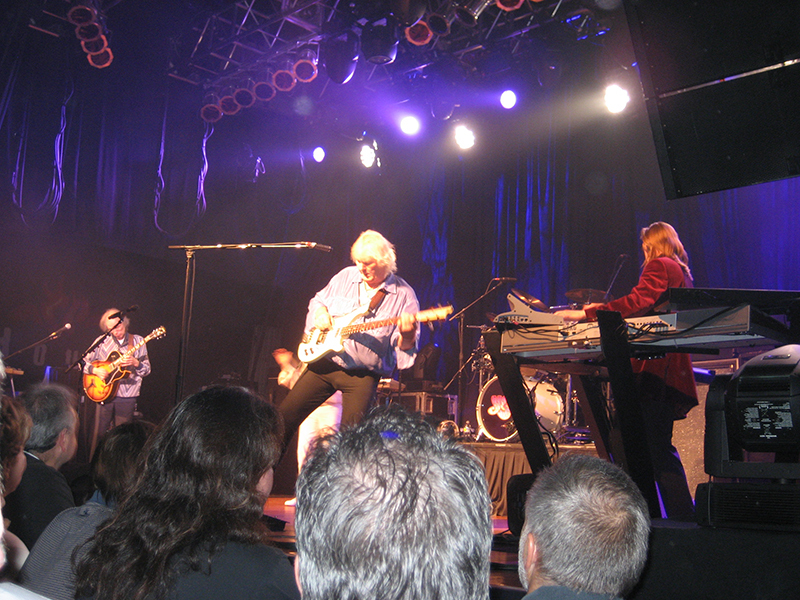 Each tour was different and served the purpose of the day, to keep Yes music alive and current. This current line-up of Yes is serving that purpose well. They performed the entire set list last night as listed from previous shows, including Soon and "Owner" to a very appreciative crowd. I thought that the standing room only club would be a real disappointment compared to the lush settings of the Reading Theatre, but once the music started, it didn't matter. Unfortunately, the stage props did not fit in this venue, but that too was forgotten after the downbeat. One humorous moment occurred when, due to the thick fog used during "I get up I get down" on CTTE, Chris couldn't find his bass pedals. Chris, you still owe us all one "low B"! All in all, the shows are going well. 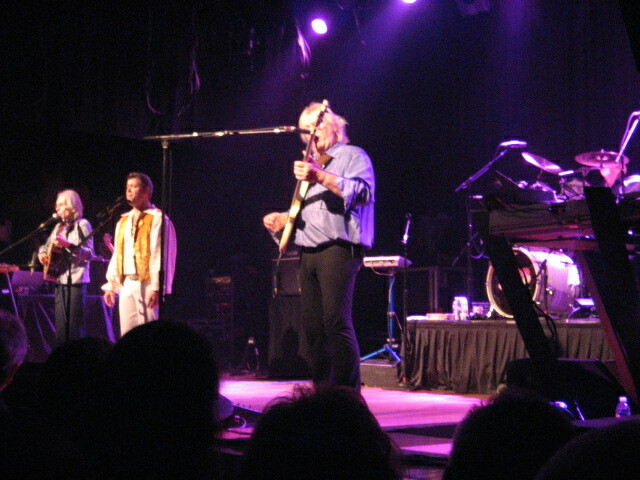 The crowd last night was very well behaved and Steve Howe did not find it necessary even once to have to "shush" any rowdy fans. He seemed to be genuinely enjoying himself. His solo, "Country Mix" is always a pleasure to hear live. Chris and Alan were spot on, as usual, and Benoit and Oliver were class act professionals. I for one look forward to more original music from all of them, as well as the return of Rick and Jon, as it is true that they cannot really be replaced - nor could Steve, Chris, or even Alan. Hard to believe that after 36 years, Alan White is still considered the "new" Yes drummer by some fans. If you find yourself on the fence about this tour, buy a ticket and decide for yourself. I don't regret a dollar spent or any mile driven to see these guys practicing their trade. It was time well spent! Good Luck to Yes on the remainder of the tour. Wow dude, I was also at the concert and I totally disagree with you. Not sure I would call myself a "diehard" Yes fan because I see so many others that know so much more about their music than I, but I have loved this band from the early 70's and still call them one of my favorites. I thought their music was solid and crisp. Close to the Edge was probably the best I've ever heard them play on a live stage. Considering how many heavies have not toured in many many years, Genesis, Pink Floyd, and even the Beatles, I am truely grateful and thankful that these guys still tour and provide us with the music that we grew up with including some new twists. We were not fortunate to see Jon and Rick on this tour, but all in all I thought this concert was fanstastic and enjoyed every minute of it! Alright, I figured I would post this while the impressions were strong - so an hour after the show, I would like to say, that all my worst fears materialized.....This is Yes, but it is not the "real" Yes. No matter how hard Steve tried or Chris attempted to rekindle the past, the show was a no go from the vocals standpoint. I am surprised so many true fans cannot speak the truth about this - but while Benoit David has a competent voice, he simply does not get the Yes lyrics nor he imbues any energy into them, thus they are just words with his competent vocals flowing across the stage - not meaning much and not sounding like much. As for the band, my better half said asked:is it because of the their enormous egos they have to tour so they can prove they can still play? I agreed with her - because Jon and Rick are just that - part of the band. And guess what? The son Oliver (as good as he is) is no father and Benoit is just that - an imitator. So in all, during the night in which we heard CTTE (ouch for vocals and keys), Machine Messiah (even Horn could not do well with this one), Soon, Long Distance, Trooper and all other bits and passages and even with very inspired guitar work by Steve, the band would be well served to take a break, reflect on who they are, wait for their ailing soulmates to recover and offer something magical. Not replicated but original. Not played but transcendental. Until then..